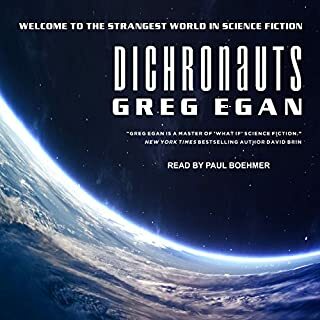 Greg Egan concocts a fascinating and thought-provoking novel that explores the role of technology in creating alternate realities, blurring the lines between what is "real" and what isn't. In this future world of globalized economy and devastating climate change, Paul Durham has scanned multiple "Copies" of himself into his computer and becomes entangled with Maria, an Autoverse aficionado. Egan raises interesting questions about artificial intelligence and morality within a technological world, and it's a high concept that is brought to life by Adam Epstein, whose measured performance and faintly rumbling voice adds a palpable and dramatic intrigue to Permutation City. The good news is that you have just awakened into Eternal Life. You are going to live forever. Immortality is a reality. A medical miracle? Not exactly. The bad news is that you are a scrap of electronic code. The world you see around you, the you that is seeing it, has been digitized, scanned, and downloaded into a virtual reality program. You are a Copy that knows it is a copy. The good news is that there is a way out. By law, every Copy has the option of terminating itself, and waking up to normal flesh-and-blood life again. The bail-out is on the utilities menu. You pull it down...The bad news is that it doesn't work. Someone has blocked the bail-out option. And you know who did it. You did. The other you. The real you. The one that wants to keep you here forever. I am torn. 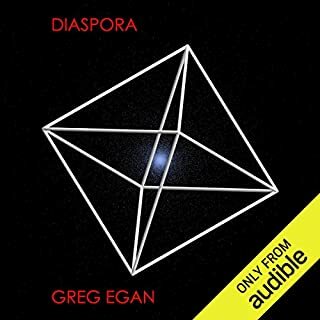 Greg Egan is arguably one of the greatest sci-fi authors of our time, and without reservation my favorite. Permutation City is an exemplary piece. I waited years for audible to release his works. When they did, I immediately went to purchase Diaspora, one of the best books, sci-fi or otherwise, that I've ever read. I clicked the sample audio button... and then checked to make sure it wasn't April 1st. Surely this was joke. I heard a whiny, nasal, mosquito buzzing voice, reading at kindergarten speed, and then using some of the most comically exaggerated and poorly executed accents I've ever encountered in a professional production. 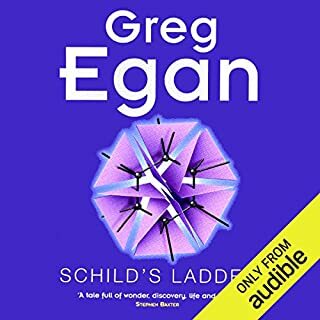 I then discovered to my horror that this narrator reads almost all of the newly released Greg Egan material. Give it a try. If the voice doesn't bother you, you are in for some seriously mind blowing hard sci-fi. If it does, pick up some of his books in another format. They are amazing. If you dig, you can find an old cassette recording of Diaspora online. It is read by John Polk, and even with poor audio quality, is far superior to kindergarten audio-torture version offered by Audible. 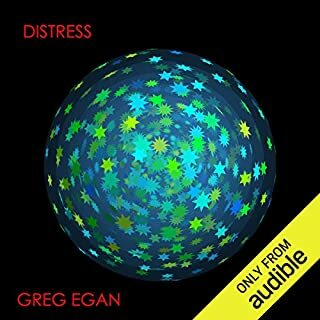 What was most disappointing about Greg Egan’s story? the publishing company must have printed the rough draft by mistake. major plot developments drop off and never picked back up, useless character have there stories re told multiple times and never contribute to the over all story, and the book end abruptly as though the author accidentally forgot the last third of the book somewhere. What three words best describe Adam Epstein’s performance? lackluster and weak. compared to the book itself this verbal recitation (wont call it a performance) is the least of my complaints, but won't be listening to books read out loud by this guy again. Was Permutation City worth the listening time? maybe - there were great concepts and moments in the book that gave it the potential to be very thought provoking. plenty of ethical and philosophical discussions on what defines a person and reality. i really lost myself in the world from time to time, but more often i noticed that the pacing was off and great ideas were being presented as major plot development only to be mentioned later in passing like the author forgot he was trying to do something with them. a story line that got repeated more than twice that added nothing to the story and should have been presented as a miner diversion at best was beat to death for some reason. overall i wanted this book to be great and maybe the final draft was, but that's not what i got to listen to. 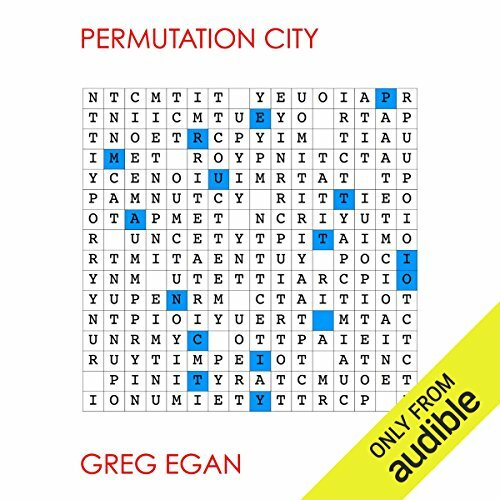 Would you consider the audio edition of Permutation City to be better than the print version? What other book might you compare Permutation City to and why? What didn’t you like about Adam Epstein’s performance? His voice is nasal, and his style monotonous: A deadly combination. On top of this, his accents were awful I don't recall listening to anything else by him, so maybe he just had a bad day. Permutation City, the Movie: WTF, Hollywood Actually Made This? Permutation City amounts to a compelling thought experiment on the nature of consciousness, self-identity, and the implications of artificial reality & existence. This is not SpaceOpera scifi; It's hard scifi and requires thinking about the ideas & concepts presented rather than passively enjoying a good story. One of my favorite books. This was the most painful narration I've had to listen to. Usually I can get used to a voice but this was... just not workign for me at all. Sorry, dude, but your voice was like nails on a blackboard. I'm sure you're a nice person though. Yes and no. The book is fascinating and well-written, but the performance is truly awful. The voice of the reader (I can't in good faith call him a performer) became bearable over time, but only just. It detracted from the story, and thus failed. What was one of the most memorable moments of Permutation City? I enjoyed both the exploration of the computational ideas behind singularity and the exploration of the emotions of people dealing with living in a society where (a form of) immortality was possible. Absolutely not. I would like to listen to more of Egan's books, but there is no way I would buy another book "performed" by Epstein. Would you listen to Permutation City again? Why? I will read Permutation City again because of the subject matter, but I won't listen to it again (see my comments on the performance below). This book is similar to Egan's Diaspora and Schild's Ladder. They borrow some of the same concepts and features of the universe. The accents the narrator affects are rather jarring. The German accent sounds more Russian and the Australian accent is a cartoonish caricature. It may sound petty, but it really does take you out of the story. Another minor thing is the pronunciation of the acronym ASEAN (The Association of Southeast Asian Nations). It should be AH-zee-ahn, but the narrator pronounces it A-shawn. If you suffer from insomnia…this book is for you. It WILL put you to sleep. Adam Epstein must have been brain dead when he read this, it sounded like a technical manual rather than a story. Many reviewers point out that the narrator's performance of this audiobook leaves much to be desired. True, but I found his reading to be passable enough at x1.25 speed and was able to enjoy the content of the book. That said, some of Egan's very complex ideas are hard to grasp via audio only. I found it useful to visit his Dust Theory FAQ page to help me sit and contemplate his ideas. Overall, the ideas are fascinating, but the character's motivations are murky. As with a lot of idea-driven science fiction, character development takes a hit. 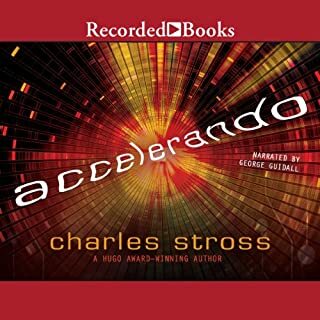 Sometimes, as in Charles Stross' work, flat or unrelateable characters make it hard to enjoy the otherwise good hard science fiction. Somehow, the brilliance and audacity of Eagan's ideas overshadow the books other shortcomings. The story is great...the reader is terrible. Dante has a level in Hell where you are made to listen to this reader. This exploration of digital consciousness is heavier on the philosophy than hard SF, although enough near-future exposition and tech is provided to support the premise: supercomputers allowing for digitization of living minds. Once that platform is established, Egan is free to play with all the high concept questions that result from a physics-free playground subject to will and desires. In the virtual environments that these uploaded consciousnesses inhabit, every sensation and perception can be modified to the individual’s tastes, as can those tastes and indeed- the individual’s own personality. The story’s drama comes, in part, from characters altering their very selves to accommodate circumstances. Additional moral questions come into play when system-generated additional personalities are introduced to provide community, and when intelligent life evolves from scratch in the VR and begin to seek their own origin. When these intelligences come into conflict with one another, or with the outside world, where the same computer resources are in demand for improving life for the billions of our reality, additional dilemmas ensue. All in all, the novel does a great job extending the trope and giving it the full examination it deserves, although it’s a bit weak on the characters or action. The ghost in the machine no longer is a ghost but a replication, a mantra for a new form of creation for making life possibilities that are beyond the grasp of death but not human despair. A complex tale of machine replicating human consciousness and human environments, to sustain immortal consciousness in imperfect machine realities. This is one of those ideas that are interesting but so full of paradoxes and possibilities of time restrictions, on not just the biological but the physicality of machines and cultures sustaining ideas of the past or possibility of maintaining a code for hundreds or thousands of years. No matter how virtual your universe it is still in having a primary reality and physics, not to mention and everchanging culture and political influences that would not at all points in time respect the needs of virtual citizens or entities that do not share a common reality, for example, in the now we do not respect even beings that inhabit our reality. And interesting mind exercise that was better developed by the movie Inception. The story here is interesting and pushes some big boundaries in hard science fiction - what constitutes reality? Is a simulation of reality in which 'consciousness' can arise any less real than reality itself? But the narration is a barrier to anything better than a 2/5 overall score. If that was better, I would gladly raise this to 4/5. No. The accent is too strong, and the pitch and timbre get in the way of the story. The accents aren't very good and one - Repetto's cod-Italian - was almost enough to make me stop listening altogether. Only the fact I was already a good way toward the end made me hold on. I loved the story - I just didn't love the performance. If you can (somehow) put the narration out of your mind, you might be able to enjoy the story. I couldn't. 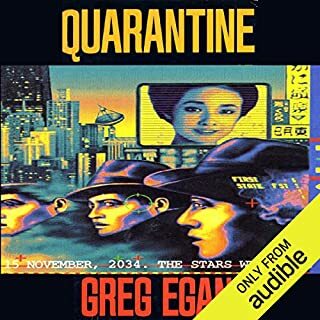 I would have continued with more Greg Egan stuff, had it had a different narrator. Shame. Where does Permutation City rank among all the audiobooks you’ve listened to so far? The story and concepts are fantastic but is let down a little by the narration. What other book might you compare Permutation City to, and why? What about Adam Epstein’s performance did you like? There are a few comments here saying Adam Epstein's performance is terrible. While not the best performance in the world it was definitely listenable and once I got used to the way he narrated I began to listen to longer chunks and enjoy the narration. Some of the concepts introduced in the book held my attention a lot more than the actual story. Concepts gave me something to think about after I finished the book. Give it a chance and take your time with it. Greg Egan knows how to ask interesting questions, and the story is compelling along the way.